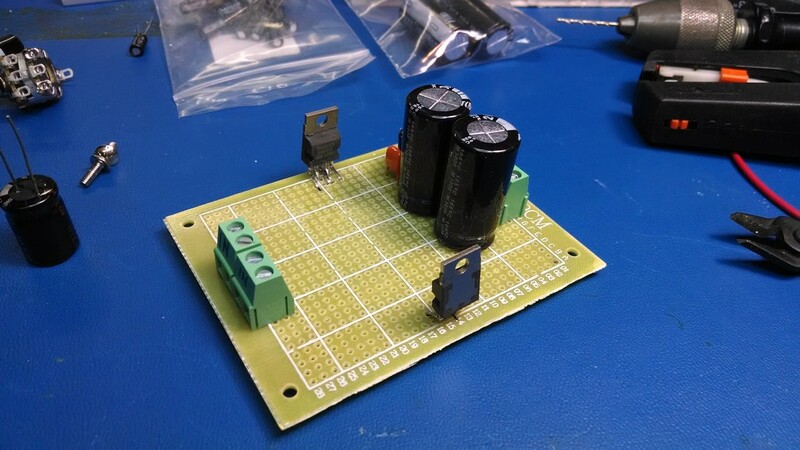 Note that the schematic shows one channel, for stereo two of these must be assembled. 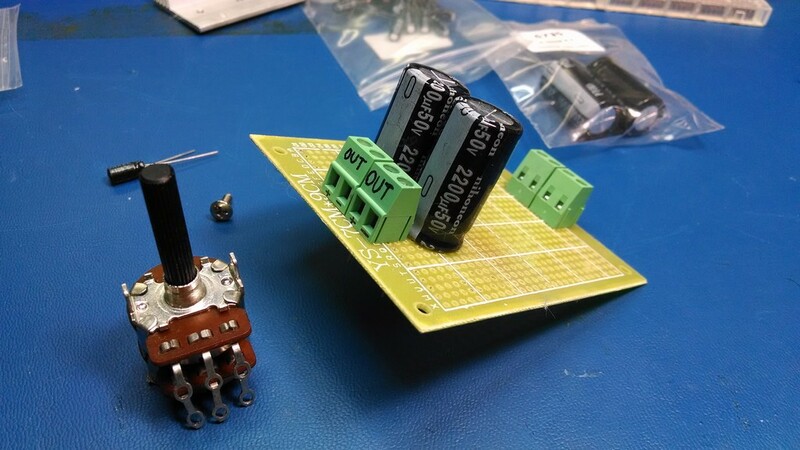 Components are mounted on a printed circuit board like this (but actually purchased via the Maker Shed as part of the Netduino kit). The board is not great, as the copper pads lift off rather easy, so watch the heat level. It’s important to start a project like this by placing the largest components first, to get an idea of where the remaining items will fit. The two 2200uf caps and the terminal blocks were attached first. The blocks were labeled IN and OUT with the polarity. Time to mount the ICs, start by spreading the TDA2003 leads, they are spaced not to fit a standard perf board. Using some long nosed pliers, the leads were bent out slightly. 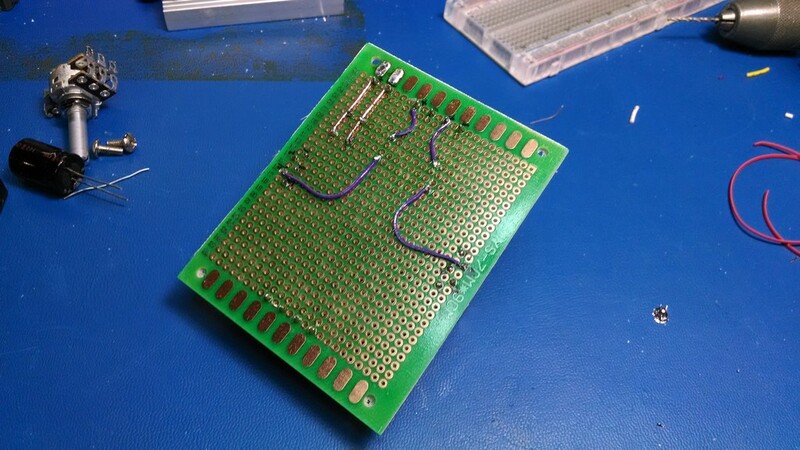 At this point, the components were soldered to the board. Some of the first connections were made also, using pieces of ribbon cable. 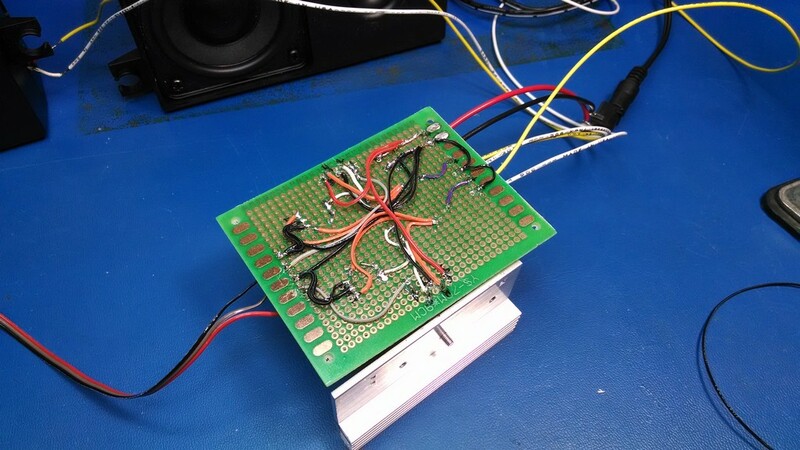 Each part of the circuit has it own color, for ease of assembly and troubleshooting. 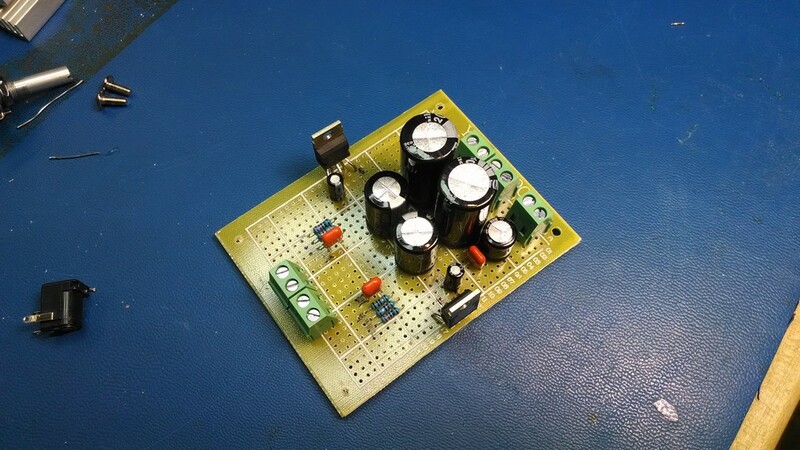 The + and – rails are wired, as well as the output capacitors. Since there are few remaining items to attached, just insert them in a logical manor. Also use a fine tipped Sharpie to label components on the board. 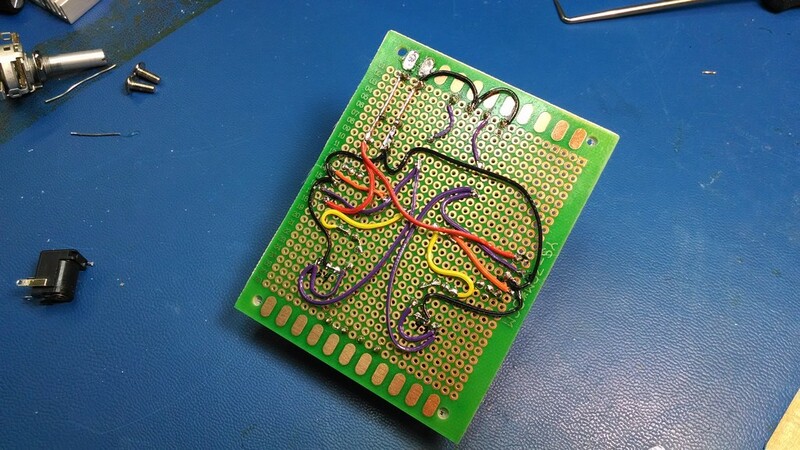 All connections made using various colors of ribbon cable. 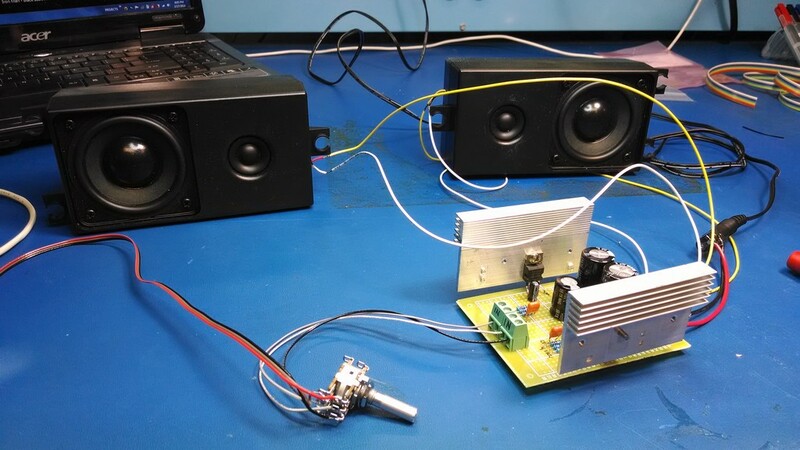 Initially, a wall transformer from an Energizer battery charger was used to power this amp. 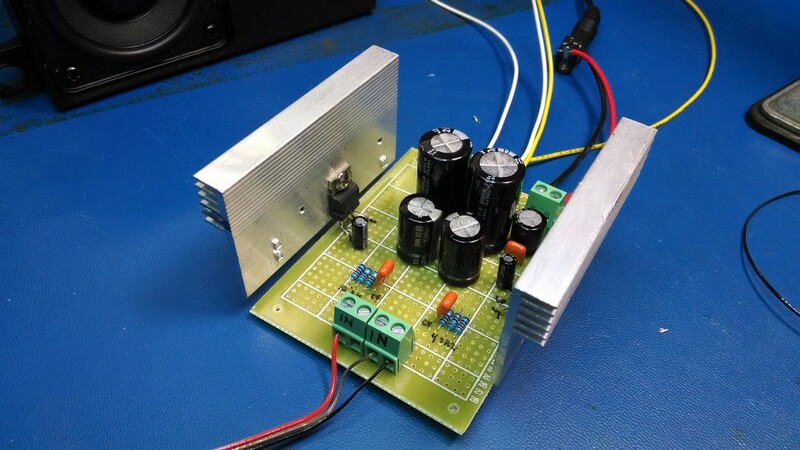 Good voltage and current rating.. the problem is that the amount of buzz and hum from this amplifier is terrible, partially because the transformer is not earth grounded. Next, an old IBM Thinkpad power supply was hooked up, it has the three pin power cable (Mickey Mouse) which supplied the needed ground. The humming was reduced considerably, but is still noticeable. The next step is to place it in a metal project case and ground the TDA2003’s directly to the chassis. So far the sound quality is decent, and pretty loud. Testing was done using a pair of speakers removed from a Vizio TV, input provided by an MP3 player.